Finally.......It didn't rain, sleet, or snow. There was no deluge of any wet 'stuff' coming out of the sky. No ice on the streets to worry about. It was brisk though. NO, it was COLD! But it didn't matter to the parade participants. On the evening of December 14th there was clearing on the horizon. 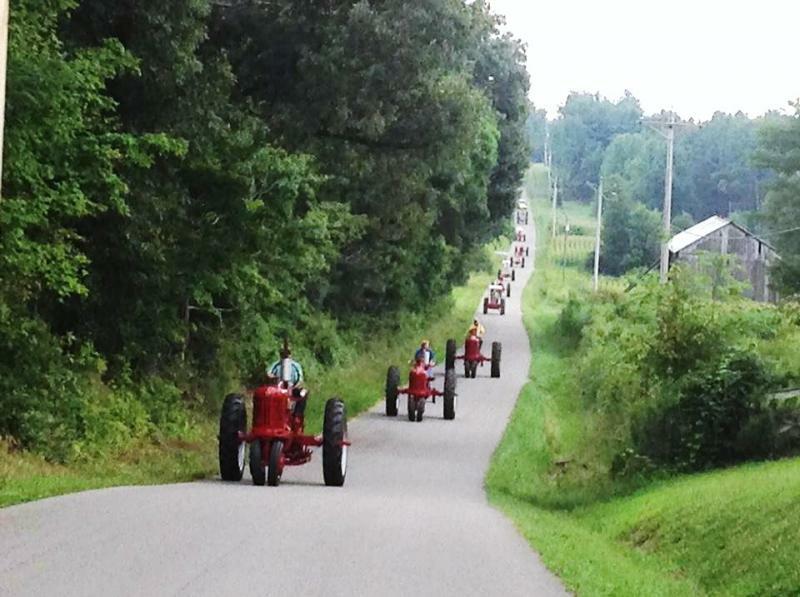 And at 5:00 pm sharp, they all stepped off to the sound of the many volunteer fire department vehicles' sirens. ﻿It was exhilerating! 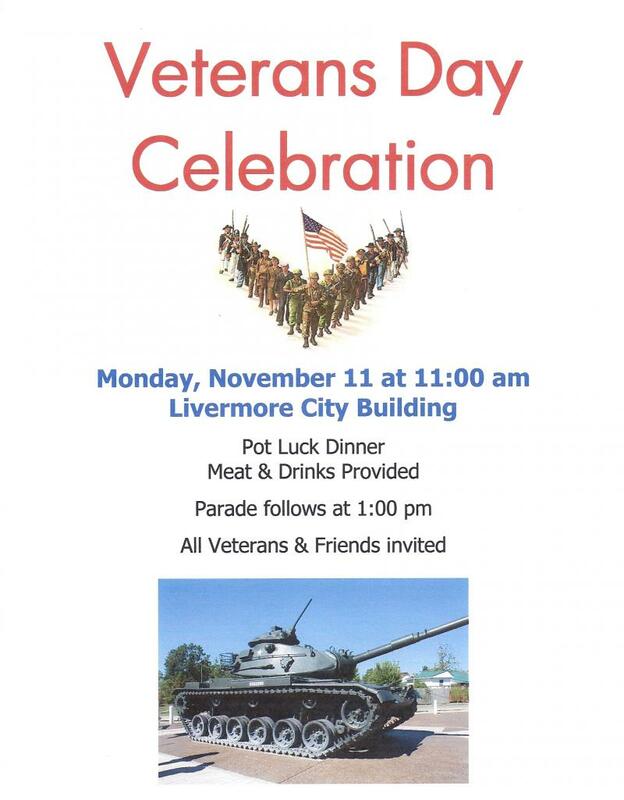 There were about thirty decorated units that paraded through the streets of Livermore. Candy was tossed to those in the crowds watching the parade while Christmas music resounded from the floats. And then Santa and Mrs. Clause appeared and everything was well worth the wait. It was a wonderful evening. 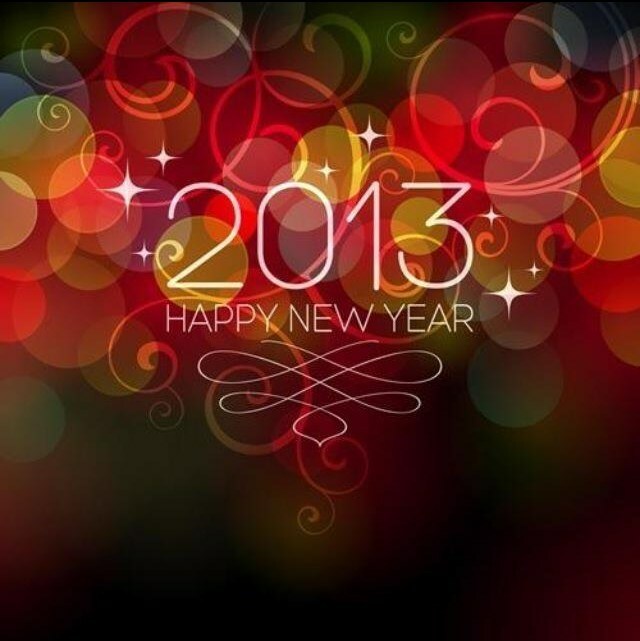 Thanks to all who participated in the parade and to those who came out to enjoy it! See the winning floats below. There are 19 beautifully decorated Christmas trees in our Christmas forest this year at the McLean County Public Library! The Gala went on with a good turnout, despite the threatening weather. Guests who were able to get out and weather the sogginess of the all-day rains on Thursday, enjoyed the Christmas forest, the delightful refreshments and the opportunity to vote on their favorite tree. During the month of December, the Christmas forest is available to the public for viewing, during normal Library hours, 9am to 6pm Monday through Friday and 9am to 8pm on Thursday and on Saturday from 10 am to 3 pm. 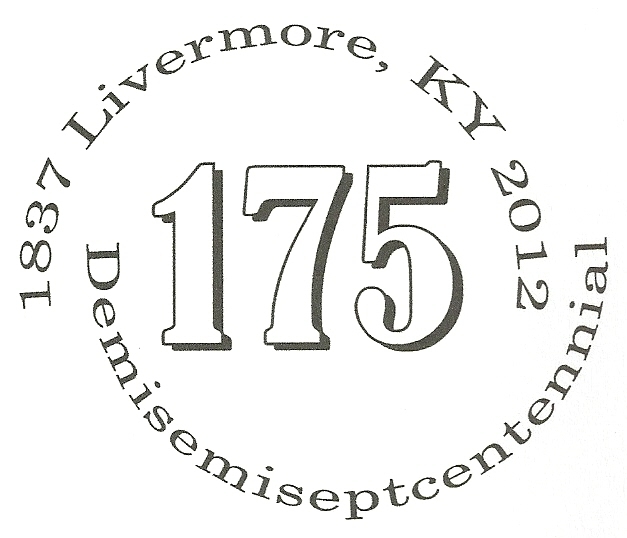 The Library is located at 116 E. Second St., Livermore, KY and is handicapped accessible. Please come visit and cast your vote for your favorite tree by dropping your change in the appropriate container. The winning sponsor will receive a plaque to proudly display for the year. The plaque will be passed to the winning sponsor of next year’s competition. 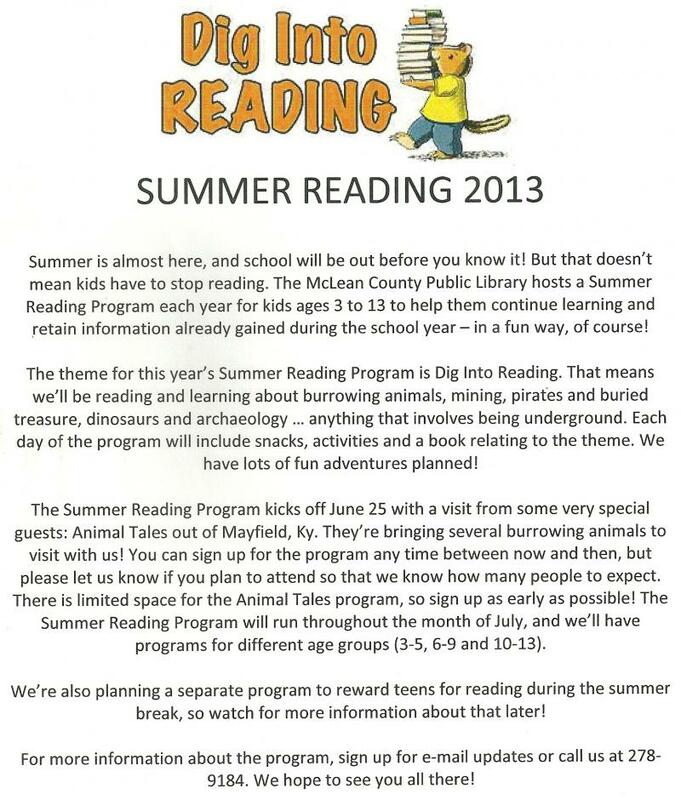 Presently, the plaque is on display at the McLean County Public Library. 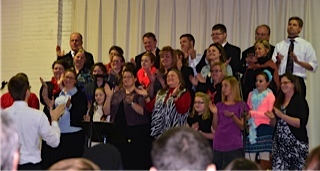 The annual Praise Sing hosted by Livermore General Baptist Church was a wonderful musical success! 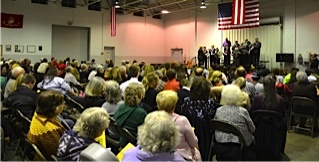 With six Churches participating, (Livermore United Methodist Church, Livermore Missionary Baptist Church, Livermore St. Charles Catholic Church, Livermore Christ Gospel Church, Community Worship Church and the Livermore General Baptist Church) the city building was filled with the 'sound of music'. And after the musical presentations, the Livermore General Baptist Church provided refreshments. It was a wonderful evening! As usual, the Livermore Veterans Day Celebration was a beautiful occasion honoring all who have served in the past and continue to do so. George Rhodes opened the program with an intrduction of all Special Guests which was followed with the Presentation of Colors by the McLean County High School JROTC and the National Anthem sung by Wayne Morris. The Veterans in attendance were then recognized as Florence Stodghill played each of the Armed Forces Service Hymns on the piano. George Rhodes honored those Veterans who passed away this past year in McLean County by reading each of their names. After which, the McLean County Junior Reserves Officer Training Corp, Honor Guard, presented a beautiful Prisoner of War / Missing in Action Ceremony. The guest speaker was Kentucky born, Eddie Price. He was dressed in 1800's style buckskins and eloquently explained about Kentucky Veterans involvement in the War of 1812. We learned our forefathers were in the thick of battle continuing to defend Kentucky's rights as well as our Country's freedom. Wayne Morris concluded the program singing God Bless the U.S.A. with all joining in. At the conclusion of the program, everyone was invited to stay and join together in fellowship at a potluck dinner. After the potluck, the color guard led a parade consisting of the McLean County High School Bank, the Livermore Volunteer fire Truck and the Livermore Elementary School children to the Memorial Walkway at the Tank Park at 1:00 pm for honors and Taps to close the celebration with a balloon launch in memory of all Veterans. Thanks to the severe weather experienced on Halloween night, the date for Halloween Havoc and “Trick or Treating" was rescheduled for Friday, November 1st at the Livermore City Building. We had a great turnout of witches, princesses, Duck Dynasty characters, Spider Men, Business Men, Owls and the list goes on and on. Games were abundant for the little ones and prizes included candy, apples and assorted sweet cakes and goodies. There were hamburgers and chili for sale and a well-attended costume contest. It was definitely worth the 24 hour wait! Thanks to all the sponsors who helped make this a success and thank you to all of the costumed attendees who provided everyone with a plethora of color for the eyes! It was a night to remember! 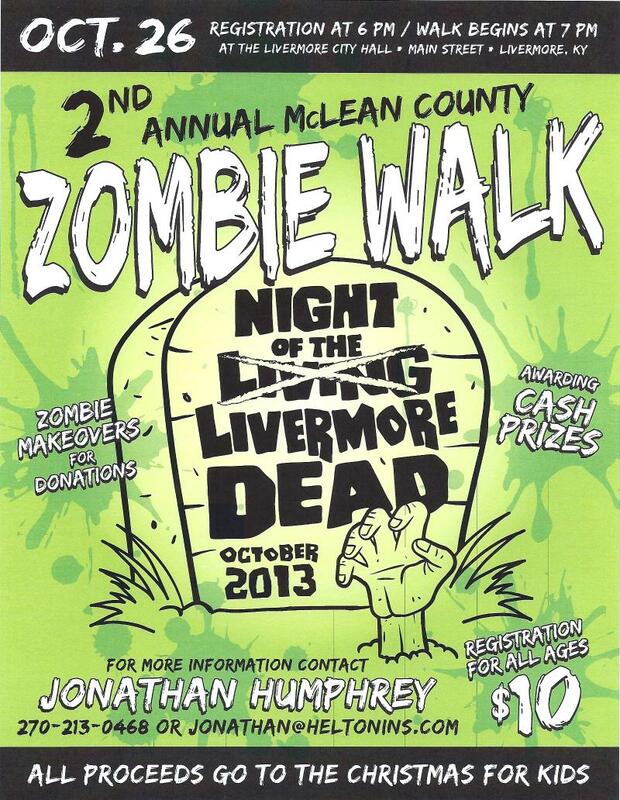 Cool and crisp with about 30 creepy, barely walking Zombies roaming the streets of Livermore. They zoned in on several of Livermore residents, much to their fear, amazement and disbelief, returning to the City building in seach of hot chocolate and some hearty good laughs! Several of the onlookers will not long forget this evening as they fled in the opposite direction of the moving flow of Zombies. Thanks to everyone for making this a special night, especially for the "Christmas for Kids" program! 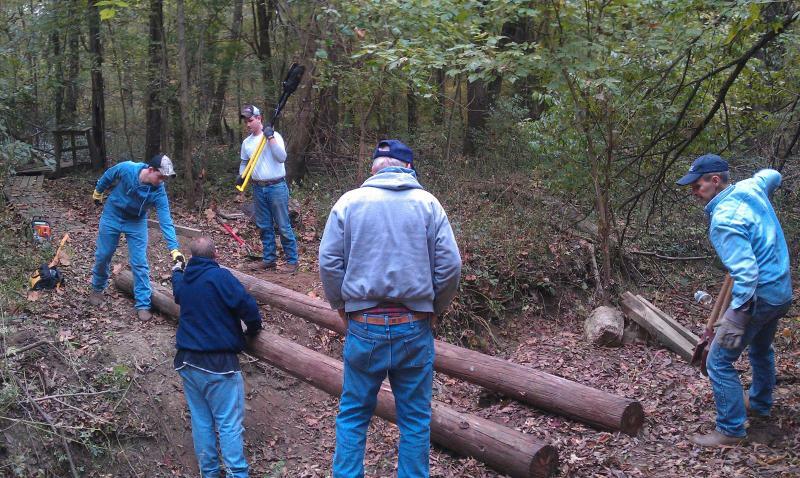 Maintaining and upgrading Livermore's Rough River Nature Trail is an ongoing process for Boy Scout Troop 35. They consistently keep it a viable natural park lands area and Saturday, October 26th, they were at it again. Flooding over the past years has not been kind to the Nature Trail and the bridges have taken the worst of it. 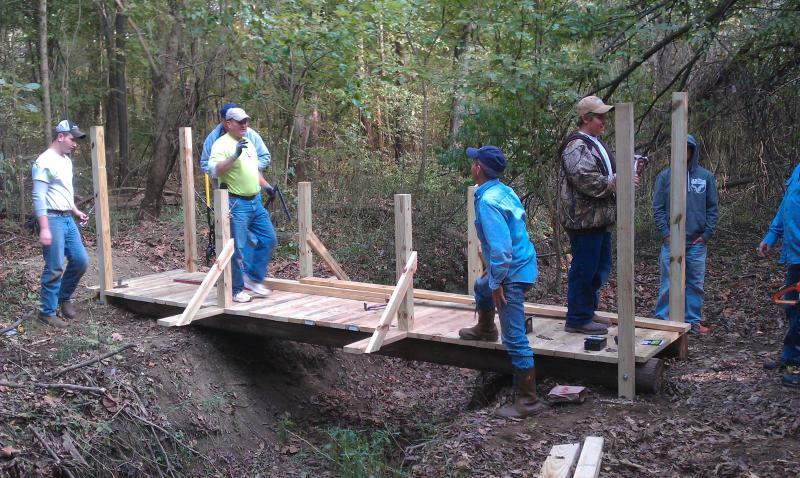 As part of his Eagle Scout project, Duncan Gowins participated in the construction of a new foot bridge replacing the original bridge which had been washed away in this year's floodwaters. 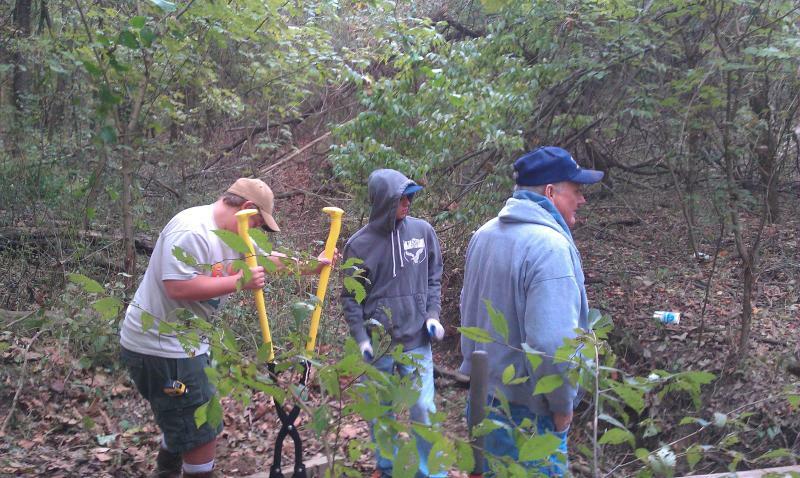 Several volunteers helped with the project including scout leader Dr. Ralph Thacker, Mayor John "Sonny" Renfrow, Doug Humphrey, Robert Humphrey, Parker Humphrey, Logan Nevitt, Bro. Andy Gowins and Duncan's good friend Kent. 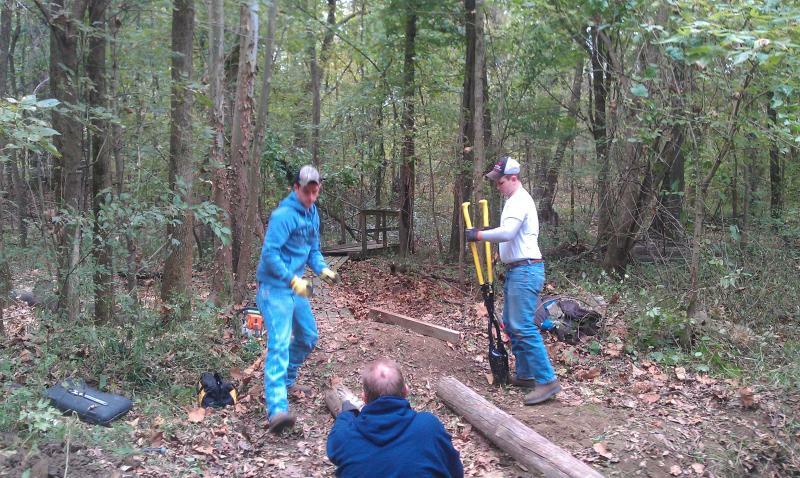 Additionally, somehow Troop 35 was also able to pull the boat dock out of the Rough River for purposes of winter storage. It was a full, full day for all involved! Thanks to Troop 35! 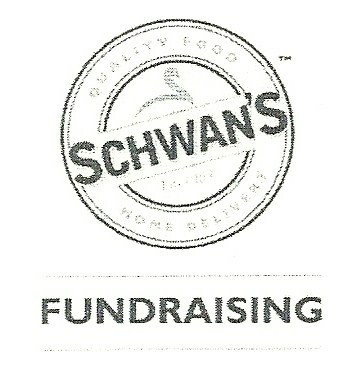 The Livermore Woman’s Club has again embarked on a Fundraising Campaign with “Schwan’s Cares”. 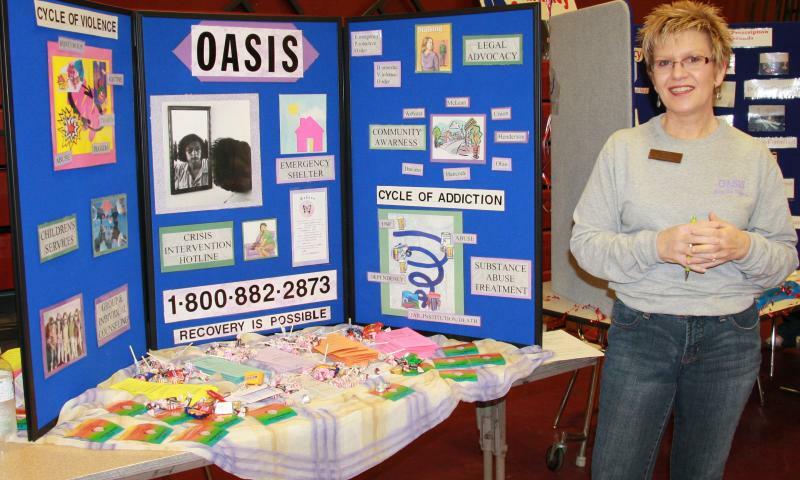 We continue to focus on multiple Community projects and are seeking your assistance. 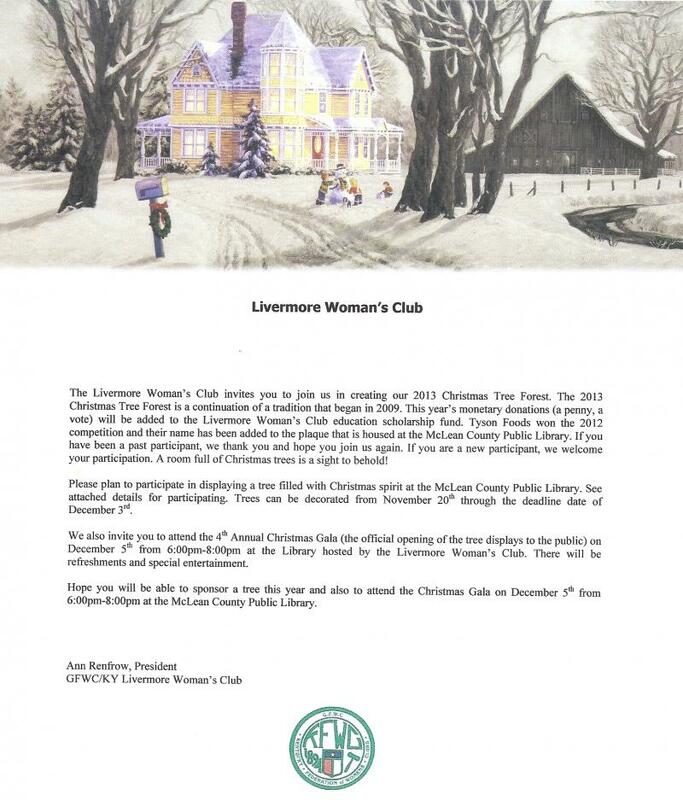 Please help support the fundraising efforts of Livermore Woman’s Club. Click on “Find a Campaign” on the home page. Enter Campaign ID: “Livermore Woman’s Club” into the search box. Find our name: Ann R.
Shop, using the online “Schwan’s Product Guide”. There's something else new on the riverfront! 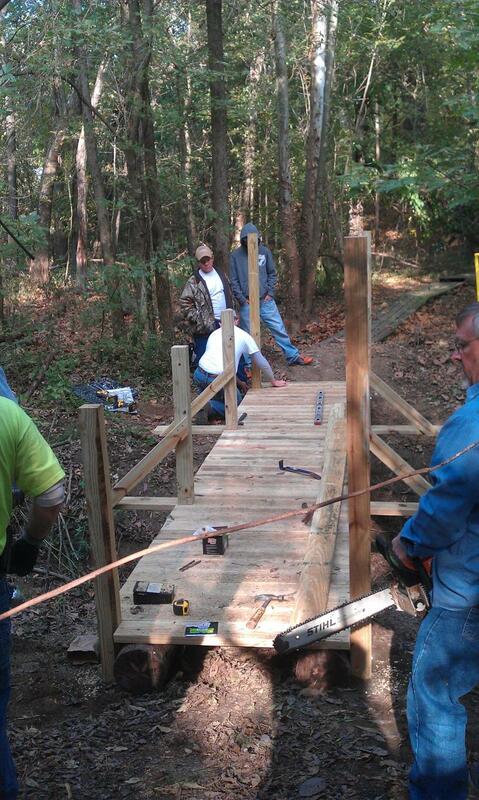 As part of his Eagle Scout project, scout Jerry Farmer of Boy Scout Troop 35 has completed the construction of an educational kiosk at the northeast corner of the walking trail around the tank and pavilion area. There will eventually be a map of the riverfront park, map of the nature trail, and information posted about various activities such as boat races and other upcoming events. This is another welcome addition for Livermore, constructed by volunteers who care about the community and its people. Nice job Jerry! 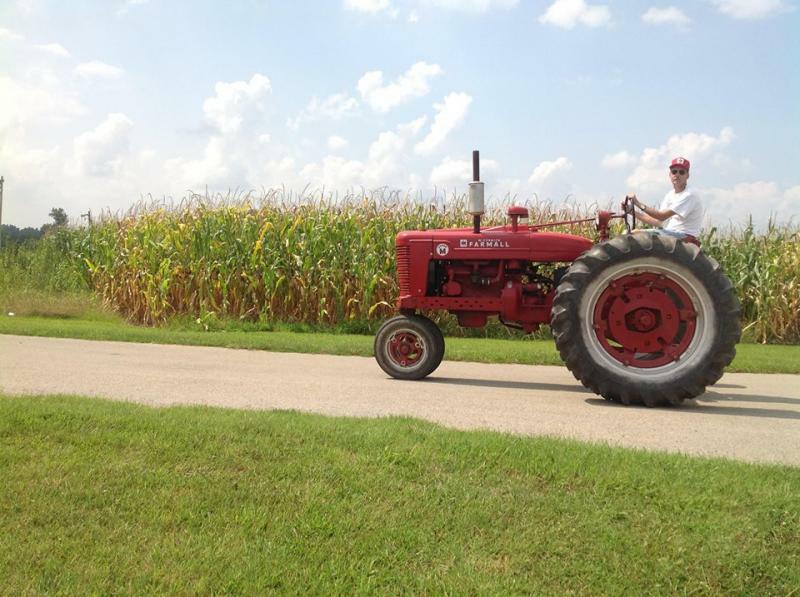 The 7th Annual Riverfest & Classic Car & Truck Cruise-in has come and gone and what a beautiful day we all had! The weather cooperated and the river breezes were just enough to keep us comfortable in the day-long sunshine! The music was just right, the many food options throughout the day were more than sufficient, the Arts & Craft vendor booths displaying their wares ranged from license plate bird houses, tin men made from sardine cans, hand-made jewelry, various holiday wreath decor to painted light bulbs, gourds and dried okra! Such a wealth of color to lay one's eyes upon. Mary Kay and Avon were there and Betsy, the Book Mobile rolled in just before 11:00. The kids had their bouncy toys, train rides, face and hair painting, games galore and Mack the Clown and his 'chicken' car came to entertain everyone with his balloon magic! The classic cars and trucks that started arriving for the Cruise-in at 10:30 that morning, varied in every shade of the rainbow and were priceless in their beauty and ability to take us all back to a different time in our lives. And when the Cruise-Around town began about three in the afternoon, the ground shook as these wonderful automobiles rolled out. It was a great sight and made everyone smile. The "Peoples' Choice" trophy was awarded for the 1959 Ford T-Bird, owned by Bobby Thomas and driven by his daughter, Cherie Ogilby. 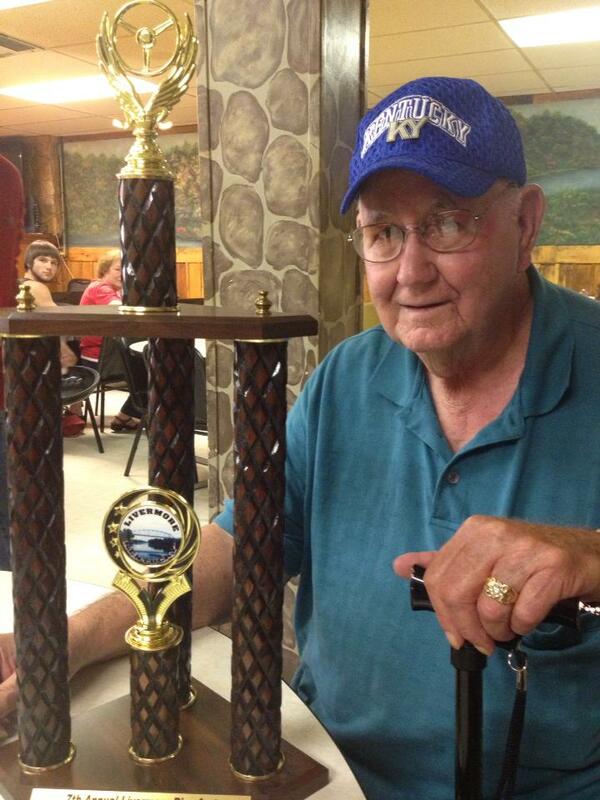 The "Mayor's Choice" trophy was awarded for the 1936 Ford Coupe, owned by Frank Shrader Jr. 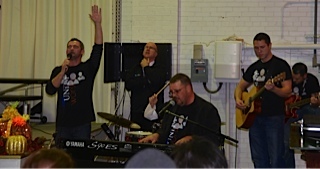 The Copper Road Band completed the day with their country/rock entertainment enjoyed by old and young alike. Thanks to our Sponsors, the Livermore Events Committee and to the many Volunteers who stepped up to the plate to make this 7th Annual Riverfest become reality!! 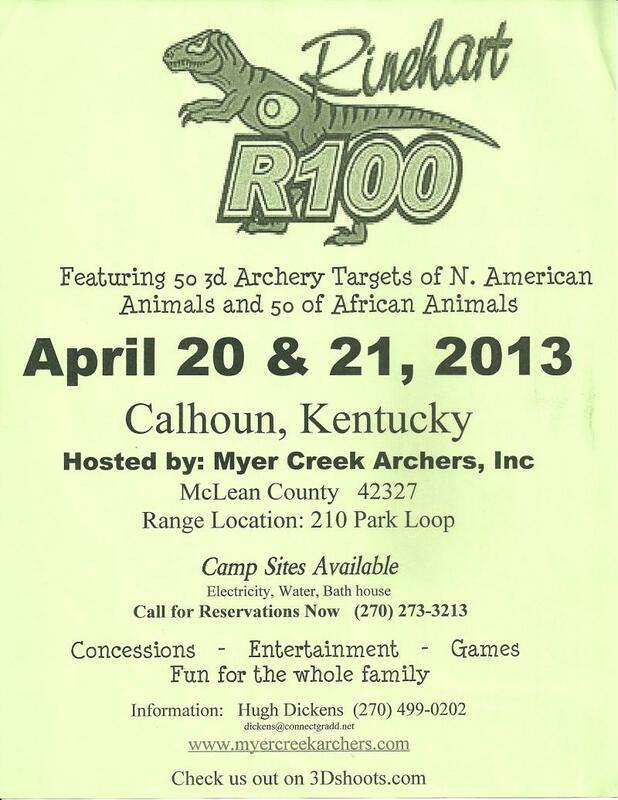 "Peoples' Choice" Frank Shrader, Mayor Sonny Renfrow "Mayor's Choice"
Admission: $9 each / 4 for $32; Kids 5 & under, free. This was the culmination to a fantastic weekend! Chapel service was held that morning mid-course on the riverside and the boat races got underway at noon. During the afternoon Mayor Sonny Renfrow had the opportunity to earn a 10 second license from the KDBA by making a high-speed pass down the Green River. One racer, Joe Don Summerville of Birmingham, Alabama did sustain minor injuries due to the unplanned deployment of his safety parachute. He was jerked out of his boat by the deployed parachute but fortunately sustained only a minor scrape on his arm and plenty of bruises. Mayor Renfrow expressed his appreciation for the willingness of local citizens and officials to help and pitch in. 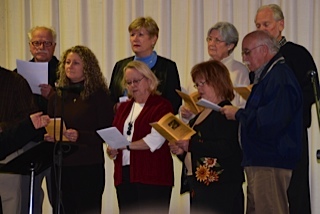 The KDBA and all participants put on a wonderful show. City employees were not utilized for this event - all prepatory work was donated by local citizens. 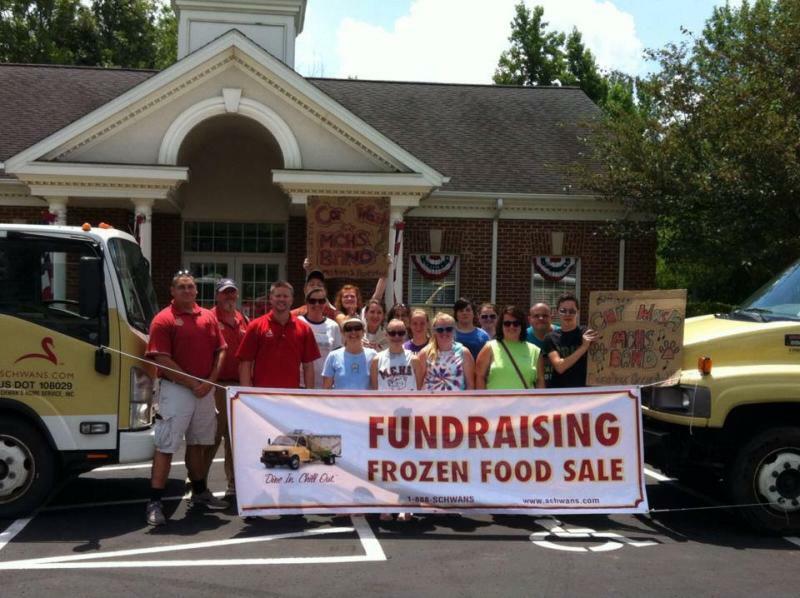 Mayor Renfrow stated "People are willing to lend not only their heads and hearts, but also their hands. That helps make it successful." If you were unable to attend "Thunder" on Sunday, you can still view the days' events by clicking on the photo links below. Additionally, the Time Trials on Saturday have a photo link available two articles down. 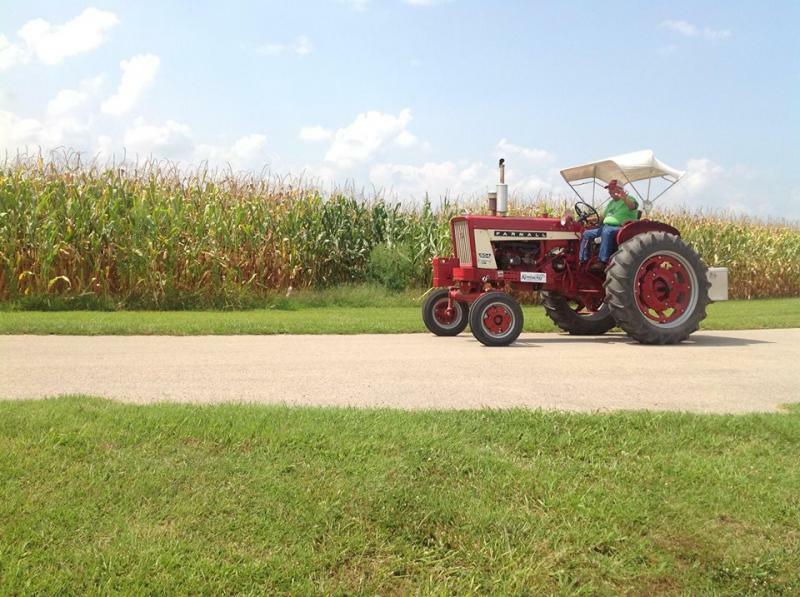 Another great day for the Livermore Lions Club Tractor Drive. It was successful in its goal to raise funds for the Lions Club Eye Screening Program. The drive originated at Myer Creek Park escorted by the Kentucky State Police to the Livermore RV Park for lunch and returned to Myer Creek Park. The 19th year for the KDBA Thunder on the Green racing event in Livermore started prompty at 11:00 am with time trials for the 45 registered drag boat racers. What a great day! Sunny and hot, but far better for racing than the day before when 4 major thunder storm cells rolled through Livermore with lightening strikes throughout the city! Talk about "Thunder"! 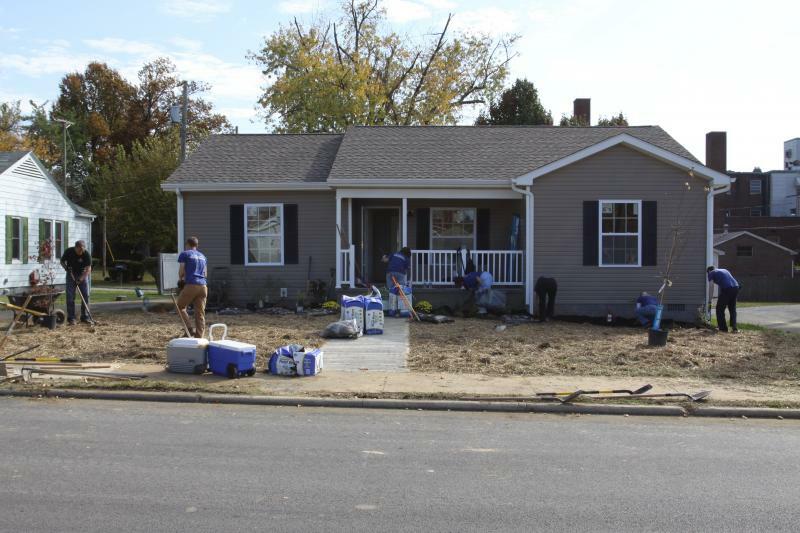 Independence Bank is partnering with the Hopkins County Habitat for Humanity chapter to build house number five in their commitment of eight in the eight counties they serve. 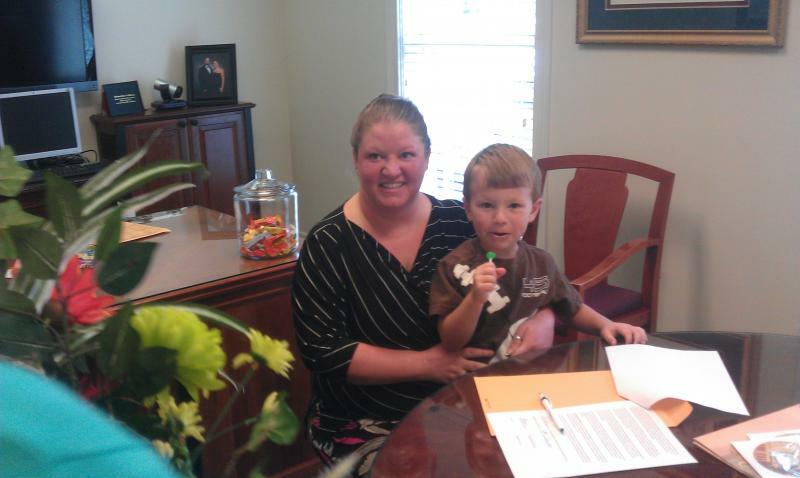 Erion Simpson of Livermore has been chosen and will soon be a new homeowner at 608 East 7th Street in Livermore. It was a very good day! A ground breaking ceremony was held on Friday, August 9th at 9:00 a.m. with the Simpson family, Bank employees and the community. The build will start on Monday, September 9th and the plan is to have Erion and her family move in early winter so they can spend Christmas in their new home. August 02, 2013 - Livermore, KY's Skatepark open !! Click on link above for some skatepark action! July 29, 2012 - Skate Park Elements Arrive! 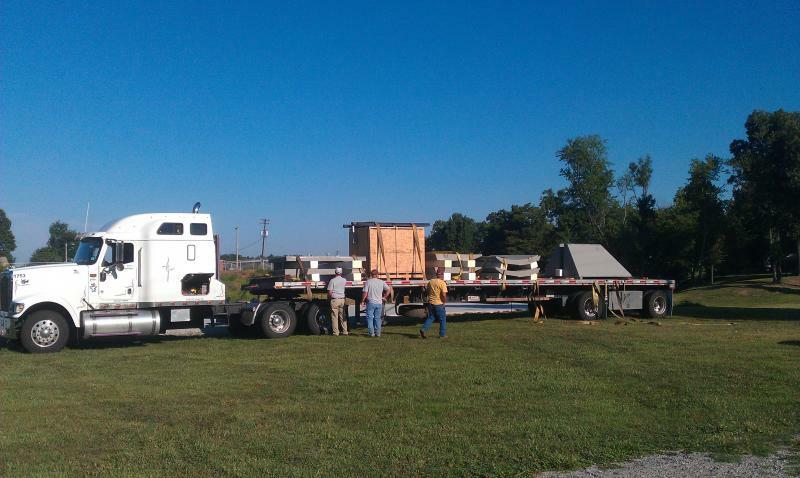 8:00 am sharp, the flatbed truck arrived at the site of the new skatepark with a load of skate park elements. Mark Logsdon drove his front-loader to the site and started unloading the various components, some weighing up to 7,000 pounds, onto the concrete poured just over a month ago. 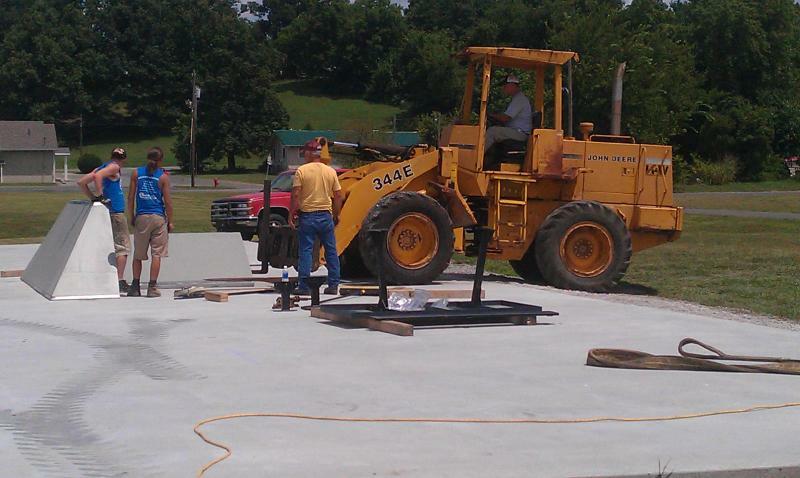 With the help of Tony Logsdon, Mike Logsdon, David Edmonds, Mayor Sonny Renfrow and the two installers from America Ramp Company (ARC), Jeremy Chavez and Cole Murray, the skatepark began taking shape! It will take 3-5 days to complete the installation and rainy and stormy conditions are not helping the situation, but Jeremy and Cole, with the help of local volunteers, are giving it their best shot. It is the hope of Mayor Sonny Renfrow that by the weekend, the skatepark will be open for skateboarding, roller blading and BMX bike riding. The City of Livermore is moving forward on its skate park. Workers from the American Ramp Company were on site on Monday installing equipment. Crews hope to finish up on Tuesday. Mayor John Renfrow says the skate park will create a safe spot for local children to exercise and have fun. "Some of the next items will be now trying to get things secure, fastened, and make some safe skating surfaces for folks. We have a lot of youngsters out who already expressed an interest," Renfrow said. Mayor Renfrow says the skate park could be open this weekend if the weather cooperates. What a wonderful holiday celebration we all shared !!!! The 4th of July started out rainy and gloomy. 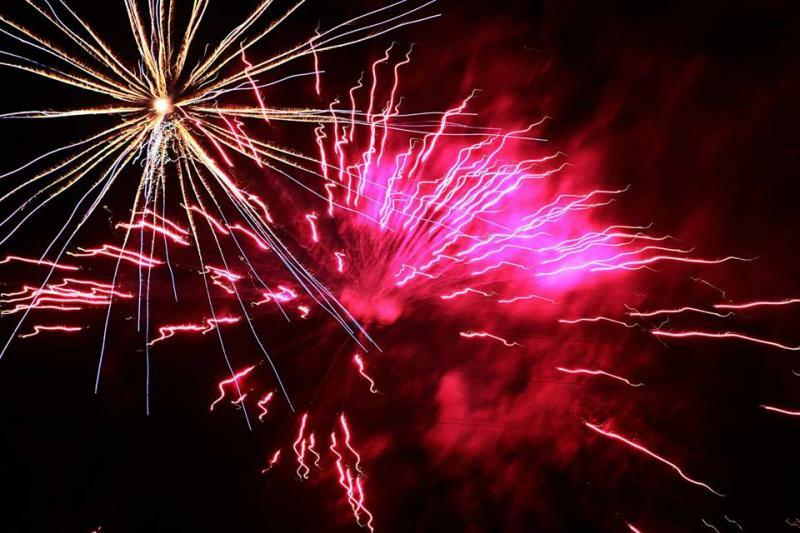 Communities all around Livermore were cancelling their fireworks and any events associated with the holiday due to inclement and rainy weather. Volunteers in Livermore, however, continued to decorate and prepare for the celebration and got plenty wet in the process. The rains did eventually stop, but the gloom persisted. Everyone associated with the event continually checked their mobile units for the latest weather projection and potential fireworks attendees drove down by the river to check with the volunteers if the event was going to come off. The answer always was "yes", provided the weather cooperates. Which is did! Kids of all ages assembled at the Livermore Missionary Baptist church parking lot at 4:30 with their decorated bicycles, scooters and wagons. At 5:00 sharp, the parade began with the fire trucks and EMS truck in the lead. There were about 60 participants in the parade all finely decked out in their holiday gear. Such fun we all had and this was just the beginning! The parade ended at the Pavilion on Dr. Sam Scott Drive, where Mr. & Mrs. Tom Newcom judged the participants' "decorated transportation". First, Second and Third place winners received $15, $10 and $5, provided by the Livermore Lions Club. Everyone else was also given a prize of $1 just for taking the time to decorate their equipment. Hamburgers, hot dogs, pork burgers and drinks were available for purchase from the Livermore Lions Club. The Livermore Woman's Club had ice cream available for purchase. And "Sweet Treats" had orange & lemon shake-ups, brownies & fried apple pies for purchase. Independence Bank set up corn hole boards for anyone to play and they were constantly in use. First Security Bank had a series of different games set up for the youngsters to play at their "Kids' Corner", always with a prize at the end of the games. 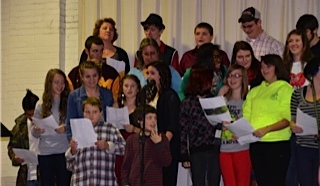 Ace Hardware sponsored the music by Aaron Pate and the Kentucky Clear Band. There were several folks dancing to the music and others just set back and enjoyed it. B.F. Evans provided numerous essentials for the event, including water and decorations. Independence bank sponsored a watermelon eating contest for all age groups as well as Bingo and popcorn. And finally, at dusk, the fireworks show (sponsored by Independence Bank) started with a bang and many declared they were the "best ever"! AND it never rained on our 'Parade' or Independence Celebration! We can thank the good Lord for that blessing! June 29, 2013 - Skatepark - 2nd concrete pour!!! This is the day we finish the concrete pad for the skatepark! At 6:00 am, there were already 17 volunteers on hand which is 5 more than we had on the first pour! The concrete trucks arrived and as the concrete flowed out of the shute, the volunteers all dove into the concrete (so to speak) with their 'rakes' spreading the heavy, wet concrete in preparation for the skreeting which levels the concrete and then the float which smooths it out! Fortunately, the heat index only rose into the low 80's versus the first pour temps which were in the 90's. But it is still hot heavy work, no matter how you look at it. Can't say enough kind words about all of the helpers - it's amazing when so many people pull together to bring about something unique and special for our city's kids - young and old alike! Now we need to give the freshly poured concrete pad about a month to fully cure, at which point the features associated with skate parks such as a 'grinder', 'table top', 'curved rail', etc. will arrive and be installed. Thanks again to everyone who enabled this project to actually start taking 'form'! Two fundraisers on the same day, same time, same location? That's right and both were successful! The Livermore Woman's Club (LWC) Schwan's fundraiser was a great success, thanks to Schwan's prime products, a beautiful day, the MCHS Band car washing fundraiser held on the same property and many good people getting involved in the process! The pictures say it all - the two fundraisers did very well. 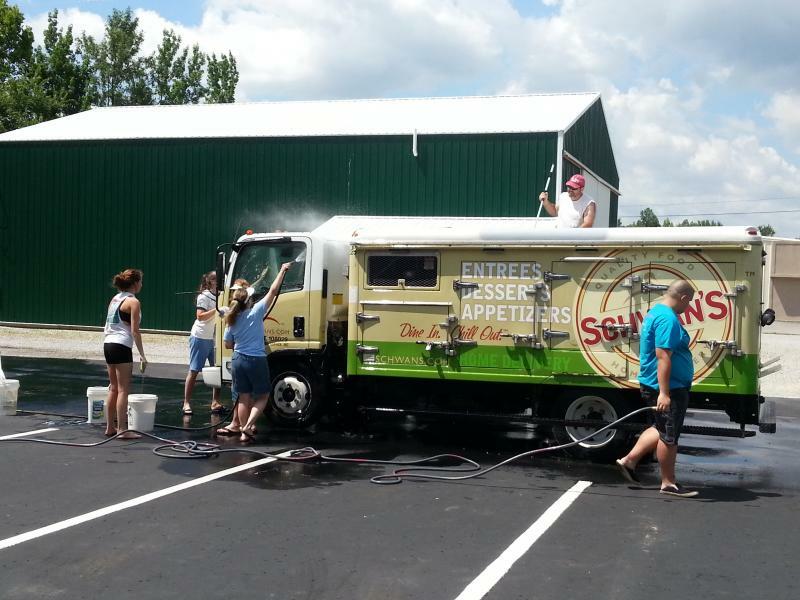 The two Schwan's trucks were even washed! The LWC thanks everyone who participated in the (LWC) Schwan's Food Fundraiser! Your participation helped to make this event successful and will assist the LWC in their many city and county projects! We thank you! june, 2013 - Skatepark rising on horizon!!!!! Twelve volunteers appeared at the site of Livermore's Skatepark at 6:00 am on one of the hottest days we've had all year! The first concrete truck appeared at 6:30 am and they were off to the races. Six pours of concrete and eight hours later, the first half of the Skatepark was poured and curing nicely. Thanks to everyone who gave up their day for this project! 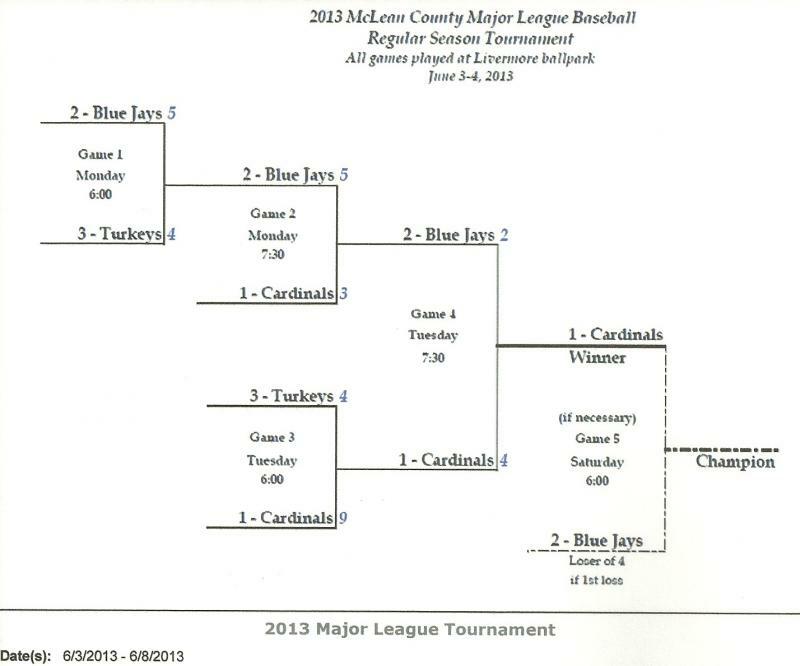 June 8 - Congratulations to the Livermore Cardinals - 2013 McLean County Major League baseball champions !! 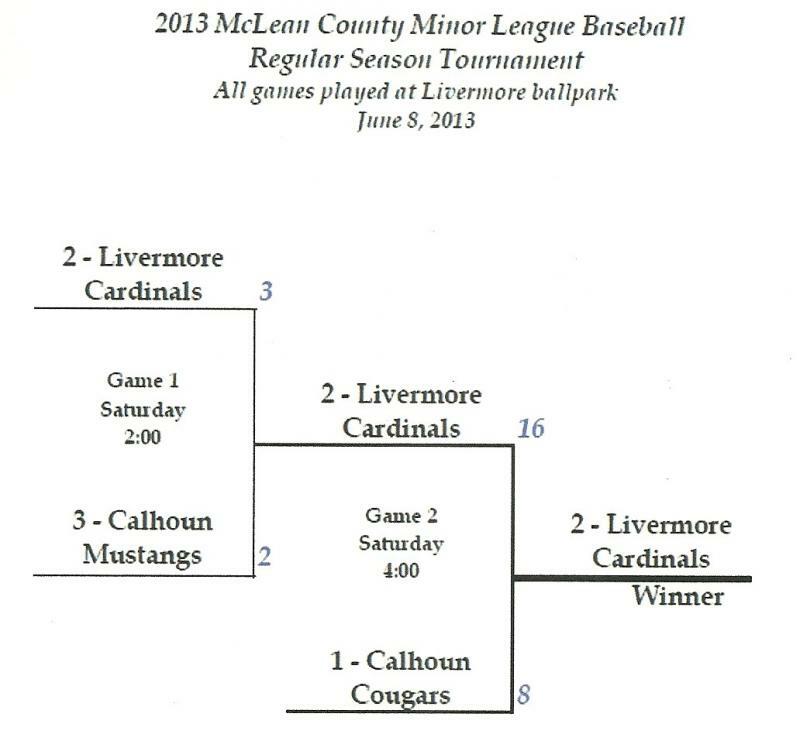 June 8 - Congratulations to the Livermore Cardinals - 2013 McLean County Minor League baseball champions !! June 3 - 8, 2013 - Baseball Tournament time Again! 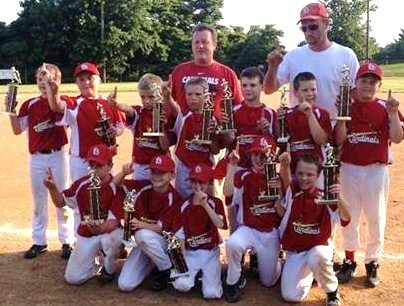 This past Monday and Tuesday were busy days for our McLean County Major League Baseball teams vying for game wins. 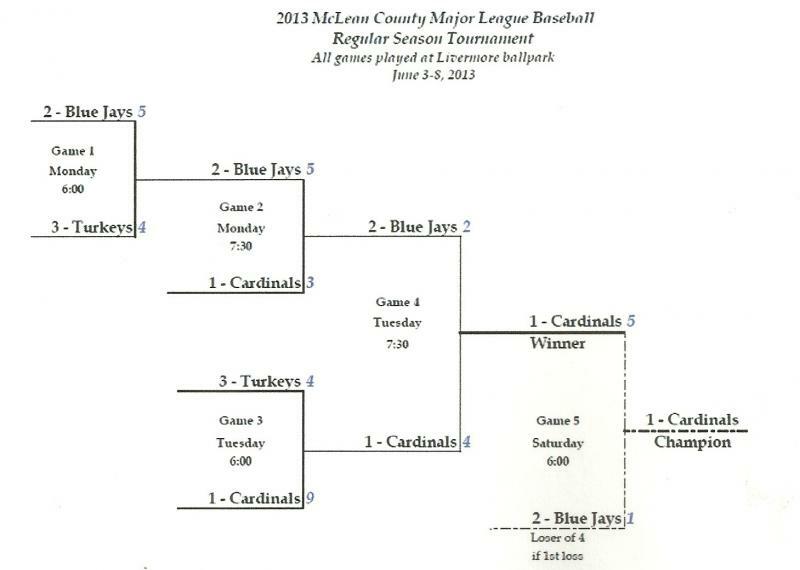 The brackets below identify the scores of the teams and now reflect one game left to be played on Saturday between the Cardinals and the Blue Jays at 6:00 pm. Come on out and cheer the guys on! The local Veterans organization placed flags on the headstones of all Veterans in the Oak Hill Cemetery and in the St. Charles Cemetery on Friday, May 24th in preparation for the Memorial weekend. This gesture of loving respect is one way for us to remember those who fought for our freedom. "Land of the Free, Because of the Brave." Thank you! Ann Renfrow, President of the Livermore Woman’s Club, presents checks in the amount of $3,393.30 to Executive Director of the Muscular Dystrophy Association, Inc., Kayla Aydt. The contribution resulted from the very successful MDA 5K Run/Walk held in Livermore, KY on April 13th. Also in attendance were two of the 4-member Event Committee, Marsha Logsdon and Mary Atherton. The 4th member, Stella Gross was unavailable. Sponsored by the Livermore Woman's Club, a 5K Run/Walk through the streets of Livermore was held, April 13th, in support of the Muscular Dystrophy Association. This organization is close to the heart of our Community, as one of our own, Tessa Wilkerson, has a form of the Muscular Dystrophy disease. She was diagnosed at 10 months and just celebrated her 16th birthday this past month. Over 130 runners and walkers showed up for this cause. There were several who were proud to run and walk as part of "Tessa's Team". She developed the design and logo on her special t-shirt which expresses her to a "T". The T-shirt reads "I'd rather be different than normal". We had young and old alike, all moving for the same purpose. It was an exceptional day for a 5K run through Livermore and many took advantage of this opportunity. The overall male winner is Cooper Bishopof Livermore, KY. The overall female winner is Darlene Hilliard, of Utica, KY. The Livermore Volunteer Fire Department and EMT's were hugely helpful, as they were available if necessary and also assisted in blocking intersections for the safety of the 5K Runners/Walkers. The Mayor of Livermore, Mayor Sonny Renfrow was extremely helpful in the selection of the route, blocking streets for the safe passage of the runners and walkers and coordinating the many volunteers who were posted along the route to help guide the race participants. On Friday, there were several club members who actually did walk & clean the 3.1 mile route in preparation for the runners, by sweeping, shoveling, using our leaf blowers and filling 6 garbage bags with road debris - all in an effort to make it safer for the runners and walkers. Several citizens jumped in anywhere we needed assistance on the day of the event and ran with whatever duties they were assigned. The many Sponsors throughout McLean County who supported this effort. The participating runners and walkers! It took a 'Village' indeed, but it also took Club members, their spouses, families and friends! We had over 30 volunteers - above and beyond our own club members! Pitching in made it all come together and work pretty much like clock work. "Make a Muscle, Make a Difference"
The Livermore Woman’s Club hosted a Schwan Truckload Sale on Saturday, March 23rd from 9 a.m. to 2 p.m. in the Independence Bank parking lot on Hwy 431 in Livermore. The Club would like to thank everyone who participated in this fundraiser. 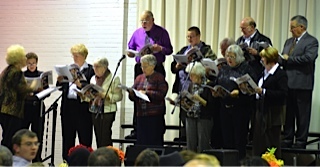 The proceeds will help fund the Club’s on-going Projects. 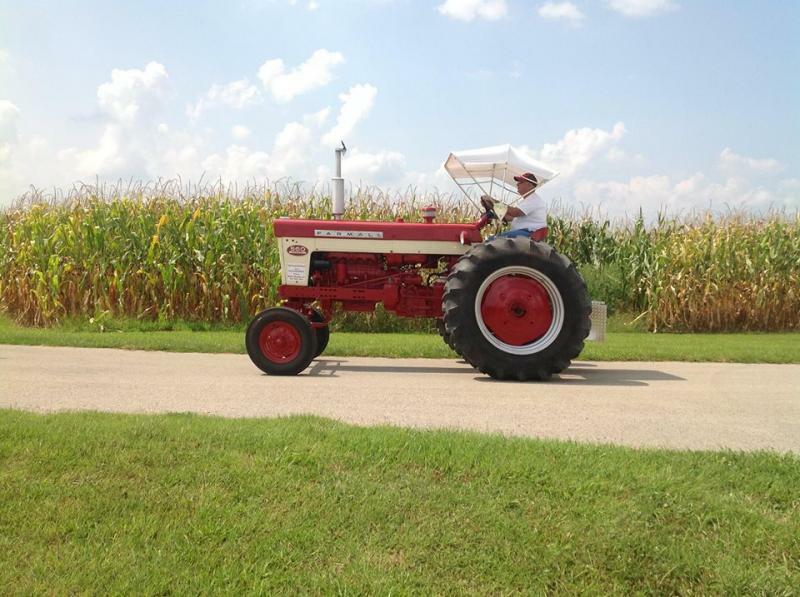 The fair was held at the McLean County High School and was a popular location to be on Saturday morning. There were about 70 vendors and hundreds of attendees enjoying all of the health and safety information offered. The McLean County Central District Fire Department's rescue life demonstration involved many of the attendees with several getting lifted into the high school's rafters. ﻿Outside, the McLean County Library Book Mobile was available as well as a McLean County Fire Truck and McLean County Emergency Medical Service vehicle for attendees to check out. It was a most informative day for all. 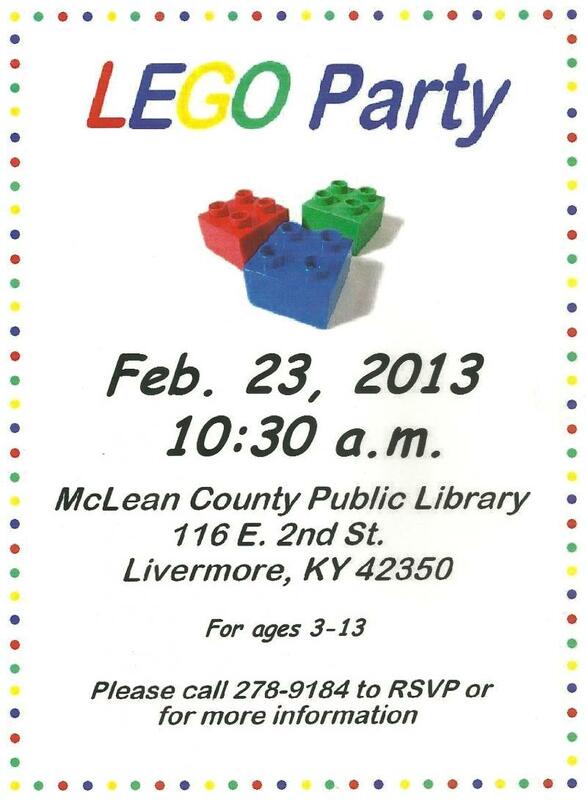 February 23 - Lego Party! Calling all architects!!!! What a great morning we had! Forty youngsters and several parents enjoyed designing Lego vehicles, buildings, animals, airplanes and many other inspiring creations. Several contests with varied rules were available for all to fully exercise their imagination - and they all took full advantage of it. Additionally, everyone received Lego-related gift bags and to top off the morning, received cookies and refreshments. 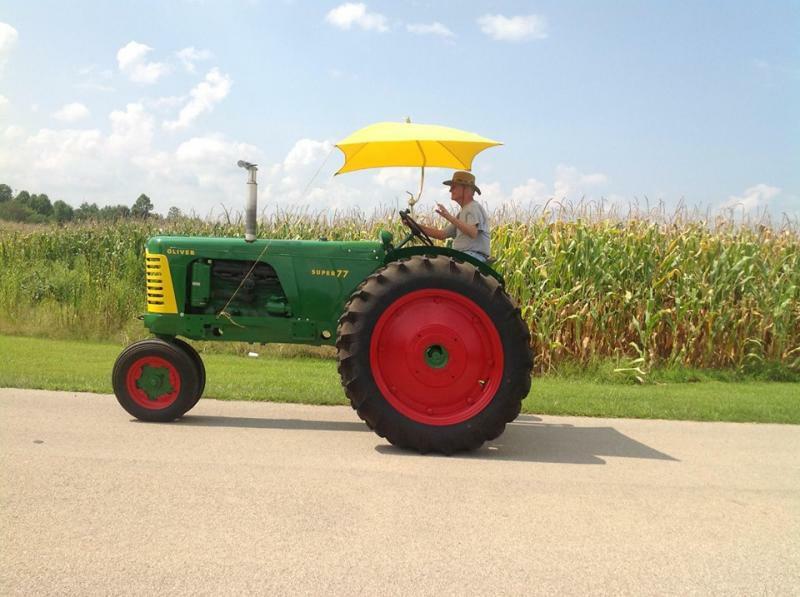 There's lots of imagination, inventiveness and creativity roaming out there in McLean County! How fortunate for those of us who live here! Click on link below for more photos from the Lego Party. Independence Bank is pleased to announce that we will again be awarding college scholarships to high school seniors from our eight county areas of Daviess, Hancock, Henderson, Hopkins, McCracken, McLean, Warren and Webster. Applications can be picked up at all participating high schools, any of our locations or on-line. 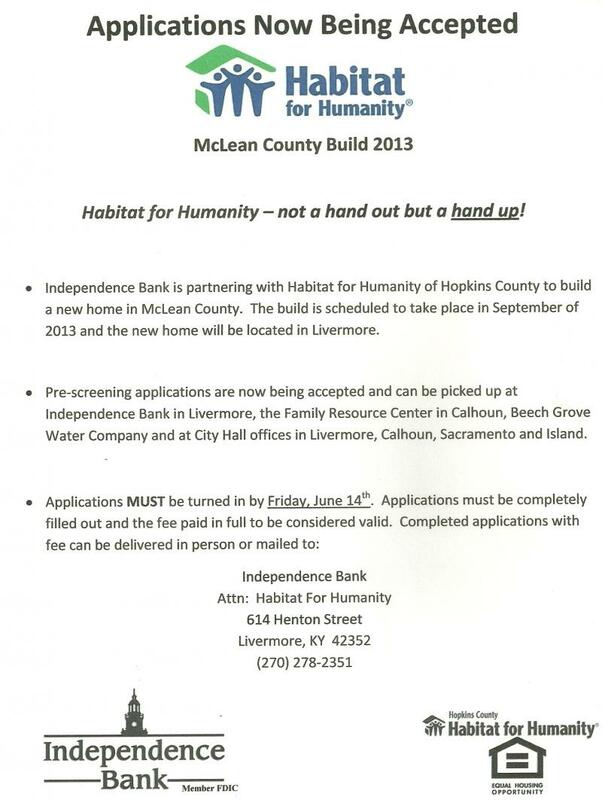 Deadline to apply is February 15, 2013. To do better, to do more, to give more, to love more. And stop worrying about "what if" and start embracing what could be. The ball dropped at midnight New Years Eve, so let's remember to be nice to each other and kind to each other all year long. If you have any other "Current Positive Happenings" and/or photos you would like to share with the Community, please contact Andrea Shelton at 270-278-2113. If corrections are required, also please advise Andrea and she will see that the web site is updated. Copyright City of Livermore. All rights reserved.